Pete Carroll grew sufficiently weary of question about the offensive line that he asked to move on. But when the line gave up 20 pressures and produced 3 points, it’s hard avoid to the room’s elephant. 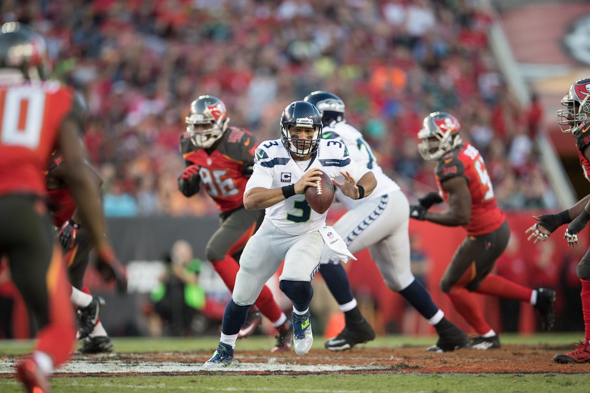 Coach Pete Carroll claims Sunday’s loss in Tampa, as gruesome a defeat as the Seahawks have had at least since 2012, was a one-time collection of mishaps, and not a sign of long-term failure of empire. Not surprising he wanted to get beyond it. According to Pro Football Focus, the line allowed 20 pressures, a brutal number. LT George Fant: “Had a hard time this game. He had a harder time, after last week playing really well. It was harder on him.” He allowed seven pressures. LG Mark Glowinski: No report. RG Germain Ifedi: “Nobody played very well. We had problems.” He also allowed seven pressures. Other than to confirm that Britt will return from a sprained ankle, Carroll wouldn’t discuss whether a lineup change is in the works until after a week of practice that figures to be intense. He did cite two things that will get attention. “We didn’t do the things we went into the game thinking was necessary,” Carroll said. “That was picking up their (stunts) and getting the football out. Seattle is a 6.5-point betting favorite to recover starting at 5:30 p.m. Sunday against failing Carolina (4-7), but two-game losing streaks aren’t unknown under Carroll. Starting with 2012, the Seahawks have dropped two in a row each year except for the Super Bowl title year of 2013. None have come so late, although in 2013 they lost two of three in December. Some reason for optimism resides in the return of several players to health, chief among them DE Michael Bennett who has missed four games games after arthroscopic surgery on his knee. CB DeShawn Shead (hamstring) was close to playing Sunday, and Carroll expects him back Sunday. He’s less certain about FS Earl Thomas’s hamstring . . . Another starter, OLB Mike Morgan (sports hernia), is back and figures to settle a spot that has churned through four starters in his absence . . .Rookie RB Troymaine Pope has a chance to return from a sprained ankle . . .TE Luke Willson has a sprained knee and newcomer DT Damontre Moore has a sore foot that forced FB Will Tukuafu back to defense for three plays. Hey, all RW has to do is take 3 steps and throw it to the savior, Graham, right? Sheeesh. I am tired of hearing about the cheapest offensive line money can buy! Pete Carroll is paid millions to create the offensive line. And now HE’S tired of hearing about it? I guess it is time to brag about Bennett returning. I am sure Russell is feeling much better about his pocket protection! Not sure what all the fuss is about. Everybody knows you can find cheap non-credentialed offensive linemen in abundance at the Home Depot parking lot any morning at about 6 AM. Just take the flatbed down there, load up, have Cable check them out, keep the ones you want and return the rest. Do this every morning for about a week until you get a combination you like.